Cross-merchandising (or cross-selling) will help you get the most out of customer food traffic in your store. The seller and the consumer both benefit from the suggestion of additional, complimentary items. Positive customer experiences are sure to help your store attract customers, create customer loyalty, and increase sales. Most people are busy and will appreciate any effort to help cut down on their shopping time. If a customer is planning on picking up some ice cream and an ice cream scoop (typically on opposite sides of the store) and they see a display strip of scoops right in the frozen aisle, they’re going to be extremely happy. They will feel your store is going the extra mile to add convenience to their shopping experience. Using the example above we can show how cross-merchandising can increase sales. Let’s say a customer is just going to the store to buy ice cream. Once they get to the ice cream aisle and see the scoops on a display strip, they realize they have bent up a lot of their own spoons trying to get the ice cream out. This customer would not have purchased an ice cream scoop had they not seen it hanging there. You are providing a solution to a problem the customer may not have even realized they had. Branding and marketing are extremely important for any business and of course the goals of these programs are to increase sales and customer satisfaction. Simply taking a little bit of time to figure out what items in your store are purchased together and creating a display will help you in reaching both of those goals with minimal effort. At Do-It Corporation, we have been providing hang tabs, product placement, and cross-merchandising display solutions since 1973. 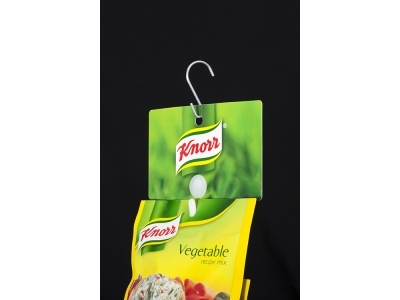 We are the largest hang tab manufacturer in the world for the retail display industry. If you would like to increase sales and impress customers with our merchandising display options, contact us today!